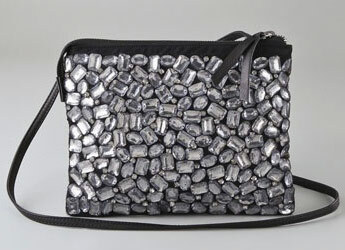 The Twelfth St. by Cynthia Vincent Cosmo Pouch in particular seems like good, girly fun. The look reminds me a bit of the Leah and Bliss bedazzled “Birkins” that we covered on PurseBlog earlier this year, but the relatively similar size, shape and color of all the stuck-on stones gives it a bit more of a refined edge. It’s so easy to find incredibly intricate, expensive, self-serious handbags covered in infinitesimally small crystals that seeing a company take that convention and set it on its ear in a fun way feels totally fresh. This bag has a great feeling of wit, and the look is big fun in a small package. Buy through ShopBop for $195.